Defense Secretary Jim Mattis, left, accompanied by Joint Chiefs Chairman Gen. Joseph Dunford, right, speaks to members of the media outside the West Wing of the White House in Washington, Sunday, Sept. 3, 2017, regarding the escalating crisis in North Korea's nuclear threats. South Korea's military fired a series of missiles into the Sea of Japan in an exercise Monday meant to simulate an attack on North Korea's nuclear test site. The exercise came ahead of a U.N. Security Council emergency meeting to discuss North Korea's test of a nuclear weapon. 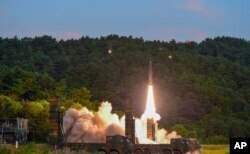 South Korea's defense ministry said Monday it had detected signs North Korea was preparing to test another ballistic missile. The ministry also announced plans to soon temporarily deploy four more launchers for the THAAD missile defense system. In this photo provided by South Korea Defense Ministry, a Hyunmoo II ballistic missile is fired during an exercise at an undisclosed location in South Korea, Sept. 4, 2017. South Korea's military said it conducted a live-fire exercise simulating an attack on North Korea's nuclear test site to "strongly warn" Pyongyang over the latest nuclear test. China's foreign ministry said it lodged a protest with North Korea's embassy in Beijing over the nuclear test, and that North Korea is clear about China's commitment to the denuclearization of the Korean peninsula. U.S. Defense Secretary Jim Mattis, echoing the warnings of President Donald Trump, said Sunday that North Korea can expect a “massive military response” if it threatens the United States, the U.S. territory of Guam or America's allies. North Korea's repeated provocative ballistic missile tests and now a sixth nuclear test seen as perhaps the first time Pyongyang has successfully detonated a thermonuclear device have presented Trump with this most critical geopolitical crisis of his young administration. “Secretary Mattis expressed the only viable option in his statement, which is a firm and clear deterrent policy toward North Korea," said Hoover Institution Fellow Michael Auslin. However, Auslin told VOA, the goal of North Korea's denuclearization, which Mattis also repeated Sunday, is unrealizable. Mattis' “imprecision was counterproductive. Will there be a massive military response against any ‘threat’? This word choice was a blunder along the lines of the promise of ‘fire and fury’ against any North Korean threats,” said Frank Aum, a visiting scholar at the U.S.-Korea Institute. A man walks past a street monitor showing Japan's Prime Minister Shinzo Abe (L) and U.S. President Donald Trump in a news report about their telephone conference on North Korea's threat, in Tokyo, Sept. 3, 2017. On Twitter, Trump said he is considering halting all trade with any country doing business with North Korea, raising immediate questions about what this could mean for U.S.-China commercial ties and the two countries' $650 billion in annual trade. Any U.S. call for an economic boycott of countries doing business with North Korea would focus most sharply on China because Beijing is North Korea's sole major ally and its biggest trading partner. 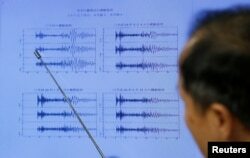 Japan Meteorological Agency's earthquake and tsunami observations division director Toshiyuki Matsumori points at graphs of ground motion waveform data observed in Japan during a news conference at the Japan Meteorological Agency in Tokyo, Japan, Sept. 3, 2017. One U.S. intelligence official says there is no reason to doubt North Korea's claim that the nuclear device it detonated underground Sunday was 10 times more powerful than its fifth nuclear test a year ago.